1. Women are more than twice as likely to eat soup as men, 9.67% vs. 4.0%. 2. The Middle English word soupen meant “to drink in sips”, which is how most soups were consumed. The words “soup,” “supper,” “sip,” and “sop” are derived from this term. 3. Andy Warhol(who’s real name was Andrew Warhola) is famous for his Campbell ‘s soup can art of the 1960’s. Did you know his first works sold for around 100 dollars? Today they sell for hundreds of thousands of dollars. 1930 Candy maker Frank C. Mars of Minnesota introduced the Snickers bar in 1930. Did you know? Snickers was the name of his prized race horse. 1941 Roy J. Plunkett received a U.S. patent for Teflon. He accidentally discovered it in 1938. 1983 RIP Karen Carpenter from complications associated with anorexia nervosa. fascinating stuff here. I love learning about food, thanks for this blog. There’s nothing like homemade soup. I remember eating it everyday for lunch when I was in Ecuador. Always prepared by my host mom. I haven’t eaten soup out of a can since. Great facts and great picture. To celebrate, I had some leftover homemade gumbo for dinner today. It’s a cold and blustery day here in NJ, the perfect day for a hot bowl of soup! That picture of soup looks oh so delicious! Hope you’re having a good day! Glad to have gotten connected to your work. I’ll be tuned in from now on. I love the way this is structured—very readable and fun! Thanks so much for following my blog and know that I find yours extremely well-written and thoughtful! As Americans we have forgotten how to ‘live to eat’ and have resigned ourselves to eating to live. Food should be so much more than that, don’t ya think? Bravo, sir! I look forward to reading more of your blog as time progresses! so true, inspired soups come from and are made for the soul. To build a soup … divine. I now know so much more about soup than before…I have several soup cookbooks and need to make some today…probably miso, but who’s counting? Love your food, er, I mean, blog. Especially the photos. Especially the background photo. Lots of eye appeal!!! Yum! I just made a pot of chicken, mushroom and Brussel sprout soup last night… A day early to celebrate! Thanks for inspiring me to be a better cook, since I enjoy food so much! BTW, your pics of food are beautiful! Can’t find where to like? Or maybe I can’t? Fascinated with your first fact, your quote – and your pic looks rather like my fave soup at the moment, red pepper and tomato. 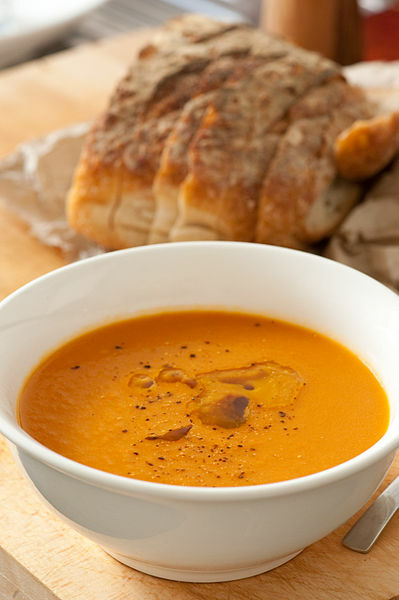 Perfect day here for soup — something bisque-y, I think! I am a woman so yes I love soup. I typically cook a different batch of soup once a week, freeze and rotate into our lunch menu. What we gain in convenience by buying prepared canned soups, we lose in so many other ways. The aromotherapy alone of a pot on the stove! Healthier, economic and great comfort food in the winter. perfect time of the year (here in Sweden at least) for home made soup, we have Panang spiced red lentil, tomato and carrot made fresh last night for today’s lunch! Everyone I know who’s lived to a grand old age has been a fan of homemade soup. It’s the stuff of champions.